From time to time you hear stories about couples who, try as they might, just don’t share the same interests (cut to night club stand-up comedian: “My wife and I go out twice a week and we have a great time. She goes out on Tuesdays and I go out on Thursdays.” Rimshot. Applause) Interests like, for instance going out in boats. “Wife says sell” reads the plaintive classified ad in the boating magazine. But what if you found someone who liked boating. What if you found someone who not only liked boating, but liked it as much or more than you did? And what if you liked to not just go boating but to go boating really, really fast? 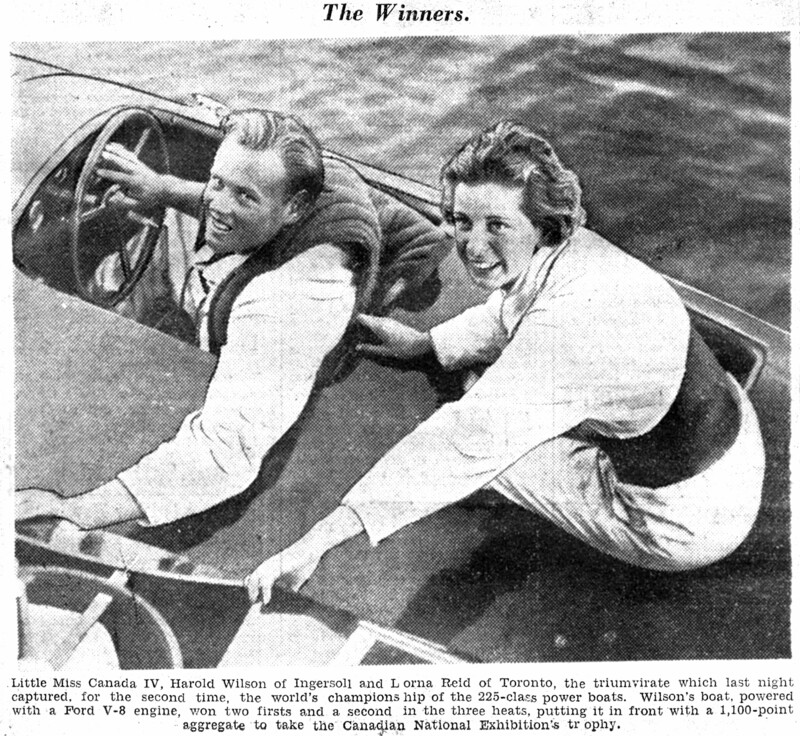 If all of those things were true, then you would be Harold and Lorna Wilson, Canada’s powerboat racing couple. Beginning with summers in Muskoka as a young man, Harold discovered fast boats and wanted to go faster. Over a racing career that spanned nearly three decades, he worked his way up from outboards to unlimited hydroplanes. Along the way, he met Lorna Reid and she joined him in the cockpit. As a husband and wife racing team, they were unique. He drove and she served as riding mechanic on the water and mechanic on shore. Their first big victories as a team came in the 225 cubic inch hydroplane class, where they were world champions in 1933 and 1934. Later on, they graduated to the big leagues and drove unlimited hydroplanes, competing in the Gold Cup, Harmsworth Trophy and President’s Cup races. All of their many raceboats boats were named Little Miss Canada and then Miss Canada. Here is Miss Canada III in 1939, the year she won the President’s Cup. 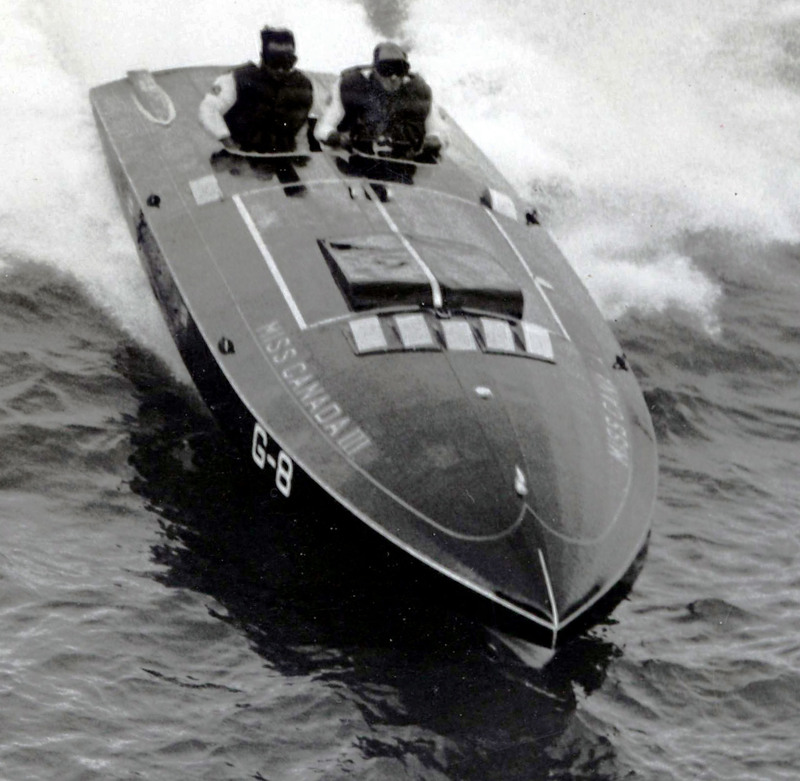 You can read the remarkable story of their racing careers in the article “Going Steady, Going Fast: The Powerboat Racing Team of Harold and Lorna Wilson,” which has just been published in the June issue of WoodenBoat magazine. You can learn more about the restoration of Miss Canada IV on the website of their son, Harry Wilson. You may see (but you’ll likely hear her long before you see her) Miss Canada IV herself out on the water in Muskoka this summer. You can see some stunning photos of Miss Canada IV after her re-launching in the summer of 2013 on the website of photographer Tim DuVernet. 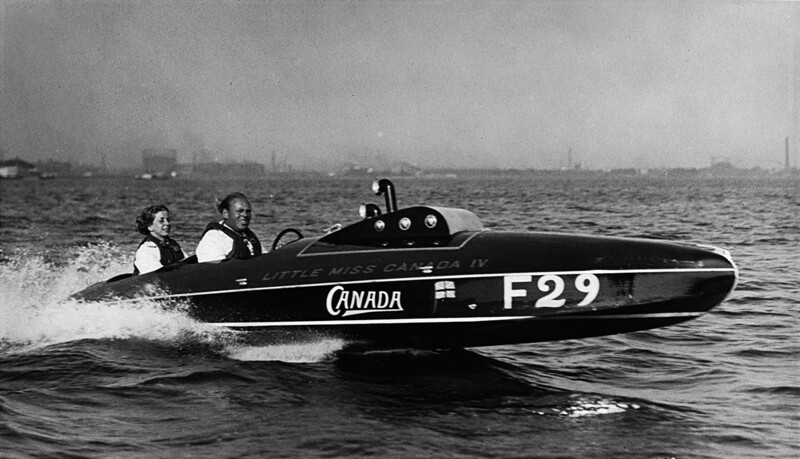 Finally, you can see Miss Canada III in the exhibit “Quest for Speed: The Story of Powerboat Racing” at the Antique Boat Museum in Clayton, NY.